Every day, one in six people in the United States faces hunger – a challenge not caused by a lack of food, but rather the continued prevalence of poverty across our country. In Brooklyn, New York, Avodah partner, Neighbors Together, is addressing this issue head-on. 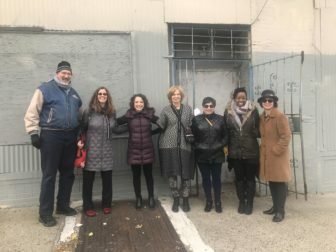 Last week, Avodah’s Board of Directors visited Neighbors Together, which serves between 300 and 400 meals per day at its Community Cafe to residents of Ocean Hill, Brownsville, and Bedford-Stuyvestant, Brooklyn, three of the lowest-income areas in New York City. However, Neighbors Together isn’t just focused on providing immediate hunger relief, but on eliminating the need for emergency relief programs altogether. Through a three-prong approach of direct emergency food service, an Empowerment Program that provides connections to vital health and social services and a Community Action Program that organizes members for fair and just laws and policies across New York City, Neighbors Together is tackling the root causes and effects of poverty. 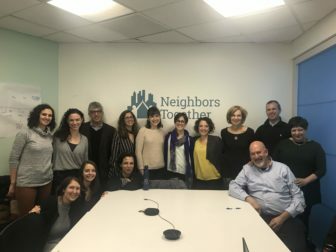 This mission and its success in fighting poverty is why Avodah has placed Jewish Service Corps Members at Neighbors Together for the last 16 years. After meeting with the leadership team of Neighbors Together, including Executive Director Denny Marsh (Avodah NYC ‘03-04), Director of Organizing and Policy Amy Blumsack (Avodah NYC ‘02-’03) and current Avodah Corps Member Hannah Cohen, the Avodah Board went on a walking tour of the surrounding neighborhood with Avodah placement supervisor and Neighbor Together’s Director of Programs & HR Nathalie Smythe. 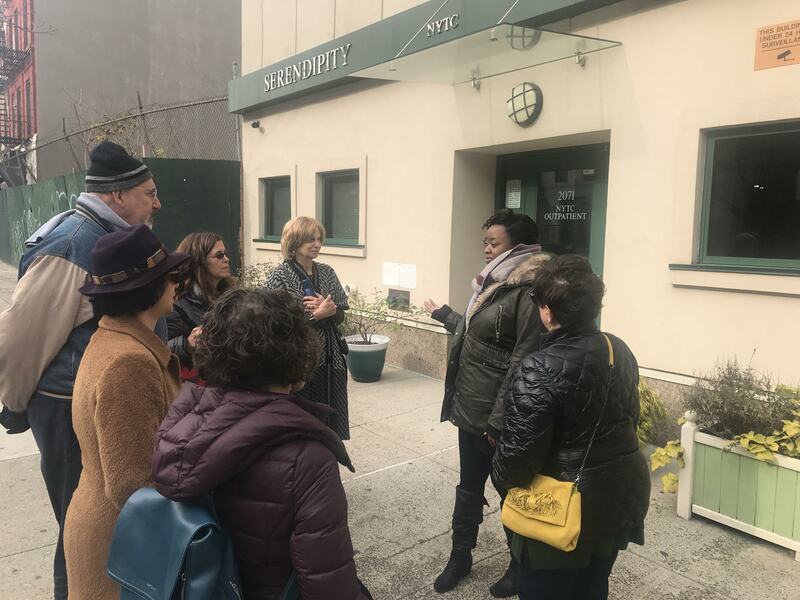 It was along the walking tour that our Board had the chance to learn about the neighborhood’s history and the systemic ways in which the residents of the area have been pushed further into poverty. One of the biggest takeaways from the day included the fact that less than a decade ago, the blocks surrounding the soup kitchen were defined as “Million Dollar Blocks,” a nickname for the amount the City of New York spent on incarcerations of the local residents. Our Board also learned of the three-quarter housing system, which while intended to help lift people out of poverty, is often the same system that hurts vulnerable individuals due to lack of governmental oversight within the leadership of such programs. As Neighbors Together works every day to provide emergency food assistance, it also bands together with local coalitions to demand tougher tenant protections and rights to help end the cycle of poverty. In fact, Neighbors Together took to the streets just last week with homelessness coalitions from across New York State to put the spotlight on New York’s housing crisis. As we come upon Thanksgiving, we’re grateful for the support of our community, alumni, partners, and friends, like you, who give us the opportunity to work alongside and support organizations such as Neighbors Together, as we work to strengthen the Jewish community’s fight against the causes and effects of poverty across the United States. From all of us at Avodah, we wish you a happy and healthy Thanksgiving. This entry was posted in #weareavodah, Commentary, Corps members. Bookmark the permalink. ← Our Hearts Are Broken. Today’s Pittsburgh Synagogue Shooting.